Powers/Abilities: Extremely powerful psionic abilities. Among the abilities he displayed were a photographic memory, telekinesis and telepathy. His telepathy was sufficiently developed that he could plant suggestions in another's mind, coerce someone so that they would turn a gun on themselves, confuse the senses with illusions (we only see him demonstrate this on animals, but there is no reason to believe he couldn't do the same to people), or predict an opponent's moves in a fight. He could tell the contents of containers by touching them, and had precognitive flashes. He could concentrate his psychic power in his own body, allowing him to punch people with devastating force or leap twelve foot high walls. He eventually managed to work out how to teleport. History: Born with E.S.P., Ernest Smith was always an outsider. His ability to predict things made other children uneasy around him, and that combined with his piercing eyes gained him the nickname "Wolfie." Things came to a head when one of his teachers refused to believe that Wolfie could complete a test with all the answers correct in only a few minutes. His parents were brought in, and it was suggested that he be referred to psychiatrist - in desperation Wolfie demonstrated his powers, throwing everything in the room around him in a psychic storm, and fled, becoming a runaway. Predicting that an old man was about to be run over, Wolfie used his abilities to save the man's life. The old man proved to be quite rich, and in gratitude (and with a little telepathic nudge) the elderly gentleman offered to let Wolfie stay at his mansion with him. But the hit and run had not been an accident, as the relatives of the millionaire were after the inheritance. Wolfie stopped several murder attempts, but ended up being wrongly accused of killing a couple of the would be assassins (who actually died either by accident or at the hands of their own accomplices). Wolfie went on the run again, this time a wanted man. Next Wolfie landed himself a job in a small cafe, using his esp to correctly predict all the regular customers' orders. The job didn't last long - when some thugs attempted to rob the cafe, Wolfie swiftly put a stop to them, but couldn't afford to hang around when the grateful owner called the police. But his antics in the cafe had been witnessed by a circus mentalist, and so Wolfie became a ring-top act. Once again, Wolfie's luck was bad. 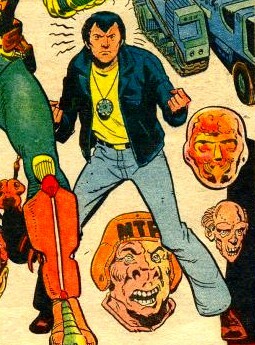 The combination of a basically decent nature with his telepathy meant he couldn't stand aside when he sensed that someone was out to destroy the circus, and so he made more enemies doing the right thing. He saved a number of lives, but having drawn unwanted attention to himself, he was forced to move on once more. Comments: Created by Tom Tully and Vano. Wolfie's family lives at No 11, Mason Street, Humberton. 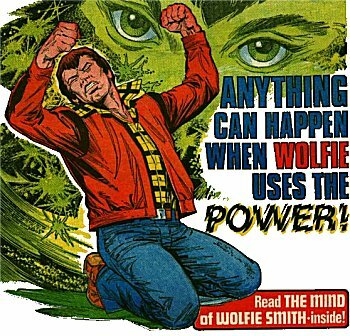 Wolfie was not a hero, but his basic decency combined with his powers and an extreme case of bad luck kept landing him in situations that would escalate out of control, leaving him a wanted criminal. He was last seen back on the run.